We have expertize in custom deployment of SocialEngine template design and customization, modification of SocialEngine code and plugins, development of custom plugins based on complex concept for your social network. "@Steve Honikman : We would be glad to assist you with your music focused network. We also have an Advanced Music Plugin for the purpose and could assist you in changing the texts as well. You can explore our Advanced Music Plugin here: https://www.socialenginesolutions.com/social-engine/advanced-music-albums-songs-playlists-plugin/ . We also have solution to continue playing Music on page loads. You can contact is here: https://www.socialenginesolutions.com/contact-us/"
"@PoeticJustice : Thanks a lot for your trust and support in our team's work and capabilities. We will definitely discuss this work within our team and would develop this feature as this is the most demanded feature currently in SE marketplace. 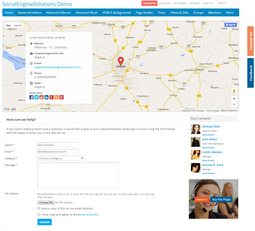 Regards SocialEngineSolutions Support Team"
"@varshaan Yes, as Donna said, it seems to be useful suggestion. And also, there can be 2 aspects: a. If the menu item is coming from a plugin, then there is a setting in the admin panel of the plugin to enable / disable viewing of that plugin based on member level (menu item will not come in case if viewing not allowed), b. You have created a new page and new menu and you want to limit the menu item of this page to some Member Levels, then instead of creating pages from Layout Editor, you can use our "Page Builder and Shortcodes Plugin: https://www.socialenginesolutions.com/social-engine/page-builder-and-shortcodes-plugin/" to create pages which has option to Hide / Show menu item of that page to specific member levels. Let me know if this helps, otherwise if you need it customized you can contact our team at: support@socialenginesolutions.com"
"@Donna Okay, got it now. Thanks!" 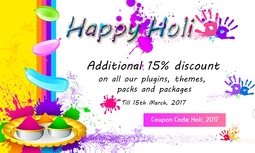 To show gratitude for your love, support and all the appreciation, we’re glad to offer a Flat 15% discount on our all the plugins, themes, packs and packages till 15th March, 2017. Browser push notifications are clickable messages in browser that come from a website. With this tool, Remind and Re-engage your visitors and send push notifications to reach your users even when they are not on your website. 2. If you have an HTTP website: All notification will be sent from your website like: push.notifyupdates.com. which improved our products and services. Now, Christmas 2016 and New Year 2017 is coming. As a gift we would like to offer 25% discount on all our Plugins, Packs, Packages and Themes from 24th December, 2016 to 2nd January 2017. We’re working hard here to provide you best of our work and support. and services in this coming year which might interest you. 1. Advanced Activity & News Feeds plugin – Will include Hashtags, Reactions, Stickers, etc features in just $89. supported, no branding for https websites, etc features in just $39. 4. Upgrades in many plugins. To stay tuned to our latest news and updates: Follow us on Twitter, Like us on Facebook . You can now subscribe to our Newsletter from the footer of our website. 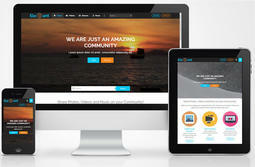 They are providing nulled version for almost all the developers. Not much can be done to such activities, but its a call to the people out there instead of going to these nulled versions and keep unsafe from copyrights, try to get a licensed copy and pay the developers for their hard work. PoeticJustice I wont lie, I am a member of that site, but i'm not happy with the nulled part of it. I joined to share my experiences of plugins purchased, issues i had, and also to share my love for you guys Social Engine Solutions, purely as i feel your part of my team, and advocating how great you are, and helping others come to you for plugins and work benefits also me, and you will beging making more and more plugins. i convinced a few people to buy your products in that forum. there was a time when you use to get help on that site, but it turned into a site where if you want help you have to give them your retail plugins for them to null. I did my best to help people having issues, but its not as good as it once was, so hopefully this community is great for us all. gs Which (as a Site-Admin) I wish SE would do something about this. Licensing was somewhat discussed in another post but my hope is that Licensing of Plugins would become an SE thing - i.e central to core and SE would manage it. I can't stand my licensed/legal/purchased Plugins repeatedly checking with dev sites to verify if I'm licensed - a hassle, slows down the site. etc. But (thanks to pirates and cheap dishonist people) we good Site-Admins that spend $1000s are penalized. But I obviously realize why Devs have to do this. There's obviously a cost to this (along with some recoding for Plugins) and although it would be directly incurred by SE, it could be indirectly paid through Devs and thus higher Plugin costs (what - maybe a buck or two per Plugn?). Heck - I'd pay a small one-time fee or a small annual fee as a Site-Admn just for the reassurance that I wouldn't have to worry about a Plugin failing due to an issue with a Dev (closing, for instance). I welcome other ideas from Devs and Site-Admins (well, and SE too of course) because this criminal/illegal problem needs to be addressed. Donna Please don't link to well known pirate sites. Members that click that can experience malware and other issues that are undesirable. I am well aware of Salman and Murad who own that and several other piracy sites. I agree that members should be very careful where they get their plugins and who they let on their websites. One of the main admins on there and the other pirate sites is also a hacker. Letting folks from sites that offer free "for educational purposes" plugins on your website can be letting the hackers have full access to your website and data. You can also be subjecting your members to viruses which can come in nulled software. In many cases, back doors are put in so that the person that nulled it can download your user data or hack your website. It is just not worth the risk. religion, social, non-profit, and nearly any other type of event. want to join or they are interested in. custom URL for blogs, location, multiple photo upload, reviews, etc. make complete use of the plugin. Unique and attractive 8 different views of blogs will enable you to highlight and showcase blogs easily on your website. When people arrive at Member Profiles on your website, where do you want them to first look? We suggest you to show them the Cover Photo, a large unique image at the top of the member profiles that represents who your members are or what they care about. This plugin provides you the option to show Cover Photo on top of the Member Profiles with Attractive Tabs, Profile Photo, Member’s basic details [configured from admin panel] with a choice of 3 design templates. Admins can also choose a default Cover Photo for Member Profiles based on their Member Levels, enable / disable members to upload their Cover Photos. Video Importer & Search Extension gives functionality to import videos directly on your SocialEngine Community. This Extension save your time by automatically importing videos from admin panel of this extension. Now, you can easily search YouTube Video on your SocialEngine Community website without redirecting YouTube website. You can search videos by using any keyword using search box and see preview of videos with Video Title. This basic, simple and powerful tool will help your user to search videos without redirect to YouTube and Post Video on your SocialEngine Community. Today, is the world of Videos. Video is an electronic medium for the recording, playback and display of moving visual media.Videos are more engaging as compared to the static content on your website. Videos help you make your visitors stay longer on your website and it is also becomes more important to attractively display the videos on your website. First, you can choose Facebook option from member level setting of Advanced Videos Plugin. Now, you can choose Source “Facebook” from drop down from “Post a Video” form. After click on “Embed Video” below popup is shown. Next, copy and paste the generated Code into text field. Now, you can choose Source “Twitter” from drop down from “Post a Video” form. To embed a twitter video on your website, get started by clicking on ••• in a Tweet and then selecting “Embed Video” (as seen in the example below). Next, copy and paste the generated Code into text field. With the new reCAPTCHA from Google – Protect your website from spam and abuse while letting real people pass through with ease. asking them to read distorted text and type it into a box. discover the correct and important information on your website. customers and gather their feedback, queries, suggestions, etc easily. With this “All in One Multiple Forms Plugin“, you can create as many forms as you want for multiple purposes like Contact us Form, Feedback Form, Suggestions Form, Query Form, Price Quote Form, etc as per your need and requirements. This plugin also lets you show the form in Popup or on a Page. submissions. These managements tools are available for each form. You can also redirect users to any URL of your choice after the form is successfully submitted.